So today was the first day of school! Max rode the bus all by himself and thought it was cool. He had a busy day - PE in the morning, reading stories, and making patterns with colored blocks. He also had recess and ate his lunch in the gym. Jered and Riley had a very quiet day at home and were very happy to have Max home early, Thursdays are early dismissal at 2:00. 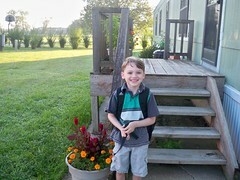 I can't believe Max is old enough for kindergarten. He so sweet and so cute. I'm glad he had such a great day.